There was an error opening this document. This file cannot be found. To make it more interesting this only occurred for certain PDFs. Even more interesting it only occurred for certain PDFs when opened with Exchange 2010 Outlook Web Access. Way more interesting is fact the exact same PDF would work when opening the attachment if sent from certain people. On top of all this – logging onto the machine as another user, the exact same attachments all opened fine. A ProcMon a day keeps the bugs at bay. So the file is there and then suddenly disappeared. How did that happen? I think this is a perfect example of even if you are not a Win32 developer some basic knowledge of how Windows APIs work is very helpful. With calls like CreateFile and CloseFile you might think deleting a file will show up as DeleteFile…but no. A lot of people I notice get confused by this so some explanation here. While Windows does have DeleteFile API (http://msdn.microsoft.com/en-us/library/windows/desktop/aa363915(v=vs.85).aspx) you will never see DeleteFile in ProcMon. Instead we will see SetDispositionInformationFile event with Delete: True in the details column. OK enough going off track. 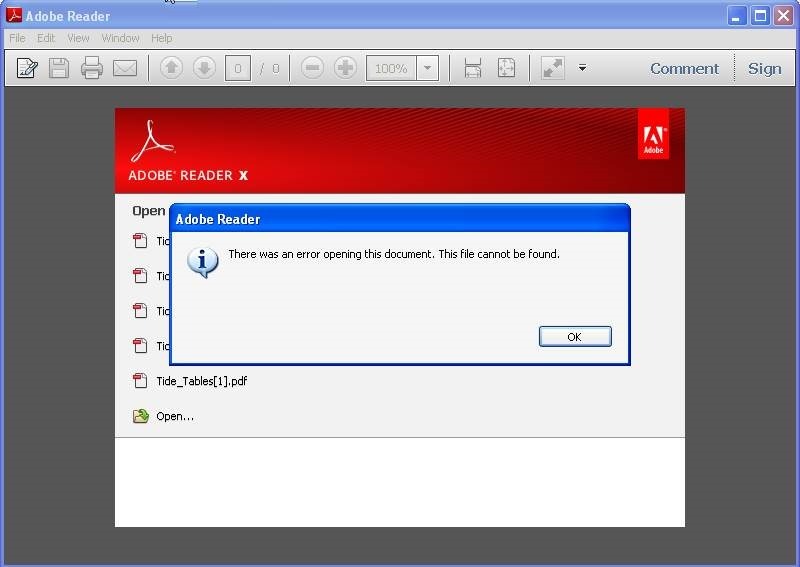 Now we know why Adobe can’t find the file. Internet Explorer deleted the file, but why? I now wanted to compare request/response headers of working/broken versions, and also to confirm the PDF downloaded correctly. 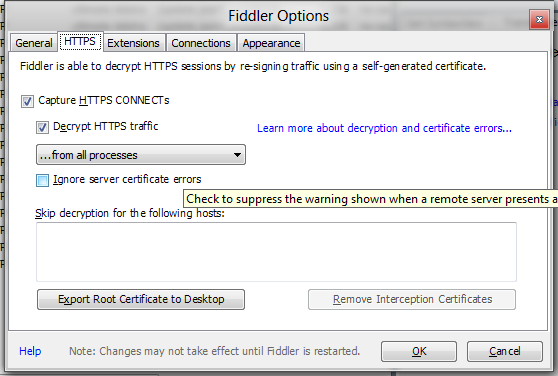 At this stage you will be prompted if you want to install the Fiddler Root Certificate so you won’t get https warnings when logging with Fiddler. If logging on a users machine remember to Remove Interception Certificates when done. Enabling this feature requires restarting Fiddler. So we logged our first broken/working scenario – opening the attachment from same email; but using different Outlook Web Access server. So we then tried our next scenario – the same PDF, opened with same Outlook Web Access, just sent by different people. It seems when email had been attached by different email programs it may have resulted in a different content type being used. But this didn’t explain … why did it work as a different user? 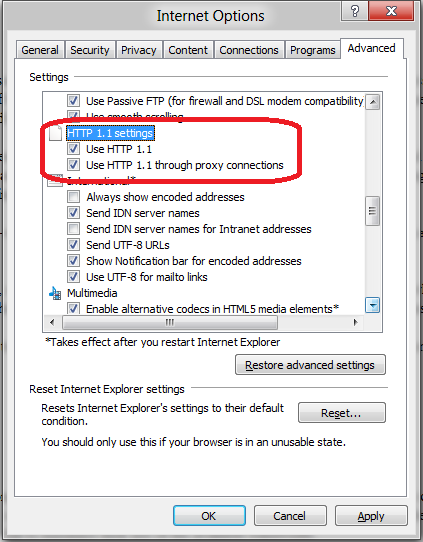 Checking user’s Internet Options confirmed HTTP/1.1 was disabled; enabling Use HTTP 1.1 and Use HTTP 1.1 through proxy connections all PDFs opened happily. specializes in end-user computing technologies. disclaimer 1) use at your own risk. test any solution in your environment. if you do not understand the impact/consequences of what you're doing please stop, and ask advice from somebody who does. 2) views are my own at the time of posting and do not necessarily represent my current view or the view of my employer and family members/relatives. 3) over the years Microsoft/Citrix/VMWare have given me a few free shirts, pens, paper notebooks/etc. despite these gifts i will try to remain unbiased. 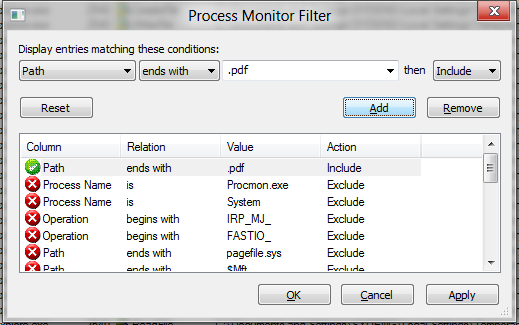 This entry was posted in Fiddler, Internet Explorer, ProcMon, Troubleshooting and tagged Fiddler PDF IIS7.5 OWA IE. Bookmark the permalink. Very interesting seeing your modus operandi – thx! Apparently the browser tries to cache the file, finds it cannot so deletes it, then Acrobat tries to open it anyway!